Not to be confused with Notre-Dame Basilica (Montreal). The Notre-Dame Church was a church in Old Montreal that stood from 1682 until 1830. From 1821 to 1822, it served as the first cathedral of the Diocese of Montreal. In 1657, the Roman Catholic Sulpician Order arrived in Ville-Marie, now known as Montreal. The parish they founded was dedicated to Mary, and the parish church of Notre-Dame was built between 1672 and 1682. A cross was planted to designate the future emplacement of the church on June 29, 1672 and the next day the first five stones of the church were laid. The church served as the first cathedral of the Diocese of Montreal from 1821 to 1822. Throughout the 18th century the city's primary landmarks were the bell tower of Notre-Dame and Citadel hill. By 1824 the congregation had completely outgrown the church, and James O'Donnell, an Irish-American Protestant from New York, was commissioned to design the Notre-Dame Basilica. 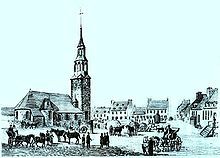 The church was demolished in 1830 and the bell tower in 1843. Foundations from the original Notre-Dame Church lie under Place d'Armes, and were unearthed during the square's 2009-2011 renovations. ^ "Cathédrale Marie-Reine-du-Monde: Historique". Cathédrale Marie-Reine-du-Monde Web site. Archived from the original on 2016-01-25. Retrieved 2009-11-17. ^ Sutherland, Anne (18 November 2011). "Bowled over by what's under Place d'Armes square". Montreal Gazette. Retrieved 1 January 2012.